BMW's X3 is built in South Carolina. PARIS -- The redesigned BMW X3, which goes on sale late this year in the United States, is larger and roomier than the current model -- and nearly as big as the first generation of BMW's larger crossover, the X5. The new X3 is a half-inch taller and 1.1 inches wider and has half an inch more ground clearance than the current model. BMW says the exterior has been updated and the reworked suspension makes the new X3 more agile than today's model. The X3 is built in Spartanburg, S.C., where BMW spent $750 million to add crossover production and increase capacity to 200,000 vehicles annually, said Ian Robertson, BMW AG board member for sales and marketing. The X3 will be sold in the United States with two six-cylinder engines. The xDrive28i is the entry model with a 3.0-liter inline six-cylinder with 240 hp. 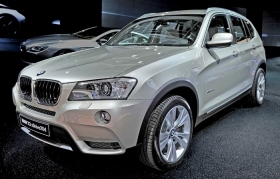 The X3 xDrive35i has a turbo-charged version of the 3.0-liter engine and 300 hp. A new eight-speed automatic transmission will be offered on the X3, replacing a six-speed.